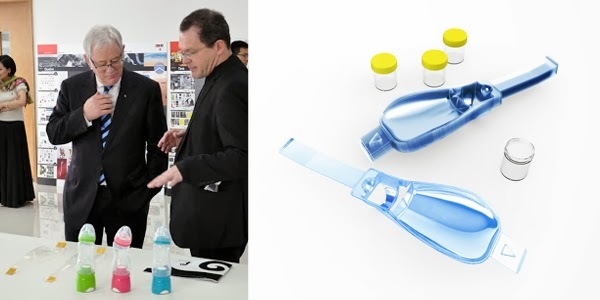 The Mittstrom Mid-Stream Urine Collection device and the 321 water bottle, both designed by Charlwood Design, were exhibited as part of the opening ceremony events at the Southeast University - Monash University Joint Graduate School (Suzhou) opening in China this week. The Mittstrom Mid-Stream Urine Collection device has recently won the BASF Plastics Innovation Award and the Melbourne and Sydney Design Awards, as well as being a finalist in the Victorian Premier's Design Awards 2103. The 321 water bottle was also included in the Suzhou H20 exhibition for World Industrial Design Day 2013. The exhibition at the new Monash campus in China showcased Australian innovation and industrial design expertise in medical and scientific device design.